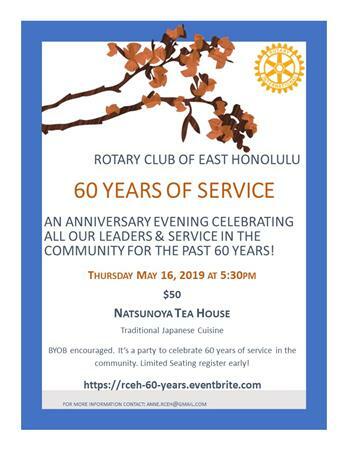 Hope you can join us as the Rotary Club of East Honolulu celebrates 60 years of service in our community. Join club friends current and past, District leaders, and members of our sister club, the Rotary Club of Kyoto South at this memorable event. Tickets are just $50 each. BYOB is encouraged. Click here to buy your tickets! For more information, please contact anne.rceh@gmail.com.